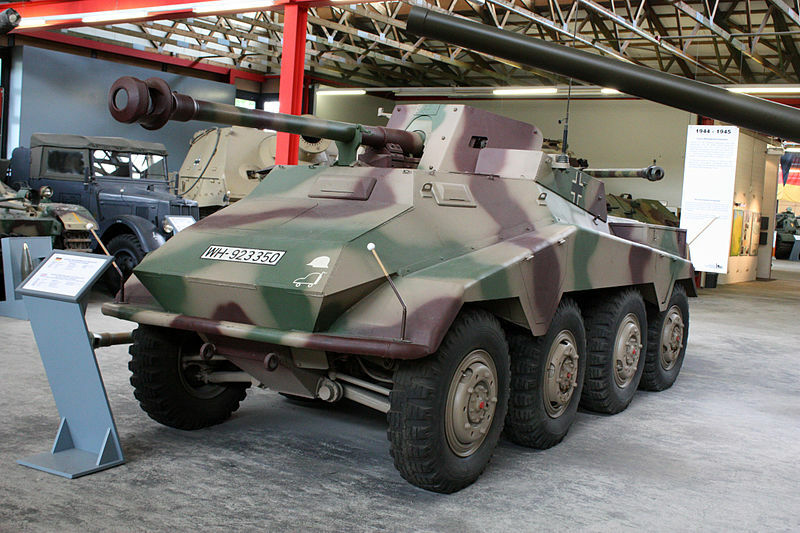 This new armored car was seen as a successor to the eight-wheeled (8×8) Panzerspähwagen Sd.Kfz.231. Among other priorities, better protection and heavier armament were viewed as crucial for the new armored car. But this model also had to comply to a specification from 1940, which requested a tropicalized armored car. Tatra was placed in charge of the overall design, while Büssing developed the body, and Daimler-Benz and Schichau devised a new turret. Three engines were tested, the third being tropicalized in the spring of 1942. 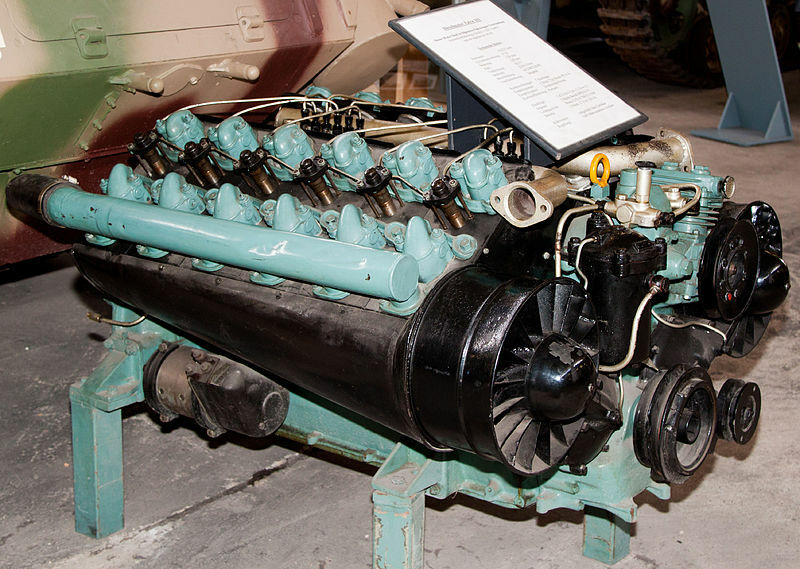 However, in June 1942, priorities changed and the final production machines had a more conventional air-cooled engine, capable of handling a wide range of temperatures (extreme heat and cold), better suited to the Russian front. 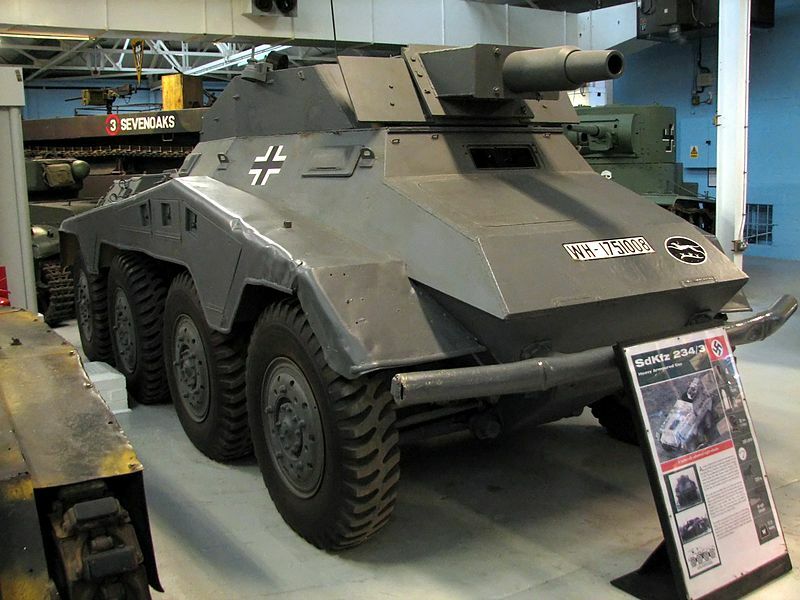 The production vehicle was heavier and bulkier than the Sd.Kfz.231, with mudguards that went along the side from end to end, with four storage compartments located inside. Because of the lack of resources necessary to build the specified new turret, housing a 50 mm (1.97 in) gun, the first series was equipped with the Sd.Kfz.222 Hängelafette 38 barbette instead. The engine was a Tatra air-cooled V12 diesel, with a net power of 220 hp@2,250 rpm, and a power-to-weight ratio of 21 hp/ton. The transmission was by claw, with 6 forward and 6 reverse gears. Fuel capacity was 240 liters, with a consumption of 40 liters/100 km. The radio was a FuG Spr Ger “A”2 set with a FuG 122 aerial. On the second version, famously known as the Puma, the main gun was a 50 mm (1.97 in) KwK 39/1 L/60. The turret had a manual traverse due to its small size, and -10° to +20° depression/elevation. Smoke dischargers were often mounted on top. On trials, the Puma was found capable of fording 3 feet 11 in (1.2 m) deep, crossing a trench 4 ft 5 in (1.35 m) wide and climb inga vertical obstacle of 1 feet and 7.75 inches, or 0.5 m.
All variants were built by Büssing-NAG between June 1942 and March 1945. The Puma turret was originally planned to be used on the Leopard, the intended replacement for the Panzer II light tank, but this project was cancelled, and the turret was “recycled” for the Puma. The standard turret version. It was the best known but not the most produced, with only 101 being released between September 1943 and September 1944. The support version. It was an open-top SPG (nicknamed “Stummel”) equipped with the 7.5 cm (2.95 in) K51 L/24 standard howitzer. 88 built between June and December 1944. The “Pak-Wagen” or tank hunter variant, open-topped with a 7.5 cm (2.95 in) PaK 40 L/46. 89 were apparently built between December 1944 and March 1945. 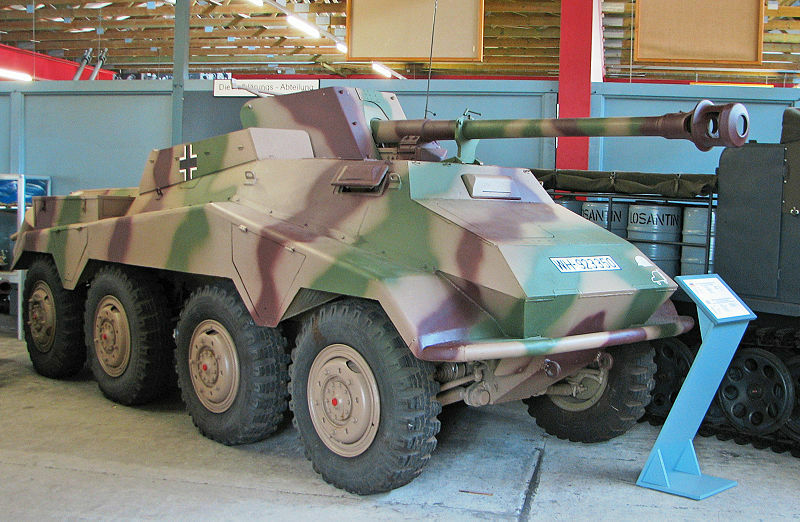 Just like the Sd.Kfz.231, the 234 and variants were used in the same composite reconnaissance units. 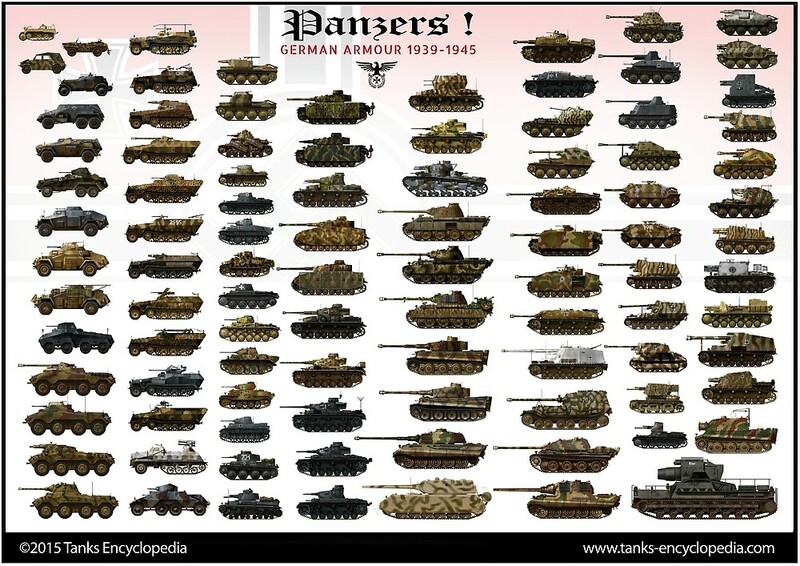 19 were issued to each Panzerspähwagen company of the Panzer Aufklärung battalions, and with time, all four variants were used in each of them, to provide either artillery, AA and AT support. The Pumas were mostly given to veteran crews and equipped four 25-strong units which equipped each a Panzerdivision operating in Russia. The Sd.Kfz.234/3 was used in 6-strong platoon in support of the Sd.Kfz.234/1 units, just like the Sd.Kfz.234/4 later. These units also participated in the battle of Normandy with good results, and the whole German campaign, but used more as fast tank hunters. By that time, on Hitler’s orders, the whole production was shifted towards the Sd.Kfz.234/4. They were well ahead of their time and the Allies captured and studied them with great interest, as early precursors of the wheeled tanks we know today. Sd.Kfz.234/1 Schwerer Panzerspähwagen mit 2cm KwK 38 in Ukraine, Panzerdivision Grossdeutschland, 1943. Sd.Kfz.234/1 in Normandy, summer 1944. 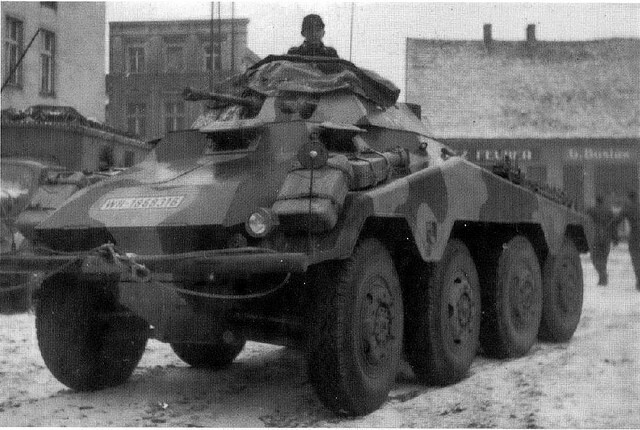 Sd.Kfz.234/2 Puma, Berlin, March 1945. Sd.Kfz.234/4 “Pak-wagen”, Western front, 1945. Side view of a camouflaged Puma, possibly on the Eastern Front, 1944. This family of vehicles would have been the kings of the reconnaissance forces across the globe if they had a chance to act as they should have!! To bad there were no more worlds left to conquer when they came into their own. I fully agree: properly used, these babies were unstoppable! Does anyone know how many kills these badboys have? 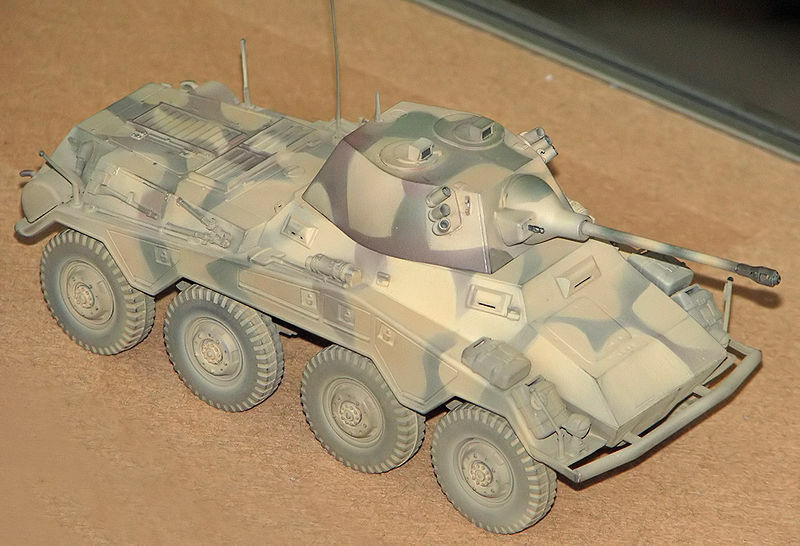 The Sd.kfz.234/2 turret seems to look like the Luchs don’t u think? This turret was never used on the Pz II Luchs, but it is similar to the one found on the VK 16.02 Leoapard. Your production dates for the SdKfz 234/1 veer from Chamberlain and Doyle’s “Encyclopedia of German Tanks of WW2.” The /2, /3 and /4 correspond with their dates. Was the 234/1 info just a typo? EGT says 200 were produced Jun ’44 to Jan ’45. The link to Leopard is broken.